This package is not a Rolls Royce product but I do hope it provides some food for thought – like a CV, its gestation has been, and continues to be, an iterative process. Job Seekers (JSs) need to be aware that there is no Directing Staff (DS) solution to a campaign and, at the end of the day, it is the individual who decides on the optimum way to conduct it. Of course sheer hard work and intuition are key components. While not a panacea this brief may stimulate some thoughts; for now it offers some ideas for your Campaign (it invites feed-back since the more relevant the document is the greater its value to your successors). 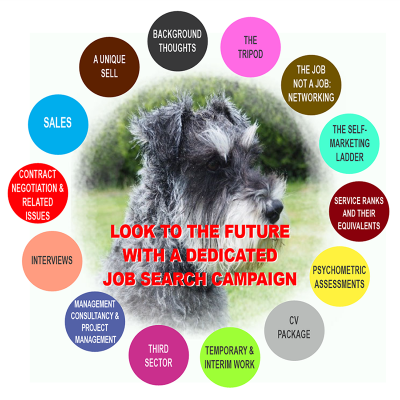 The word Campaign is appropriate to all JSs all of whom would be well advised to assume that looking for a second career is going to be hard work; as a natural pessimist, it is perhaps inevitable that I should offer such advice. The corollary to this suggestion is that if you do not find it hard work do, not tell others since that would send the wrong message. Allow me to offer four other thoughts. First, never dismiss a particular avenue of job search, rather decide how much time you should allocate to each one. For example, I have met many ex Forces folk who have secured employment through responding to a newspaper advertisement but few would suggest that the printed medium offers a primary route to success. So, you might allocate less time – but time none-the-less – to responding to newspaper advertisements while accepting that a greater proportion of your effort would be directed, say, to networking. History suggests that a job can be found via any number of means. Arm yourself with a fistful of Business Cards – and by all means use your imagination with design to grab yourself attention! The above ideas, and many others, are developed in depth in this downloadable Brief below. So, for now, good luck with your Campaign.